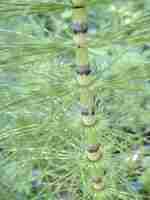 The Horsetail herb is also known with its Latin name as Equisetum Arvense. They are native to most countries in the Northern Hemisphere. A close relative to the fern, that's why it could quite easily be confused with a fern in looks. A very easy plant to grow, and can actually become an infestation if not careful. It is actually considered a weed. This herb is known for its high silicon content. Silicon is used as a glue for our body. Very good for broken bones or fragmenting fragile bones hence used for osteoporosis. It also has diuretic properties and antioxidant properties. Therefore it is used in the following situations, for urinary tract infections, stops incontinence due to bladder infections, prostate infections including kidney infections, burns and fractures of the bones amongst other uses. It is used for the treatment of hemorrhoids to help glue up the broken veins and also to improve the blood flow. It is available either as a tea to drink or as a tincture to dab on. I have never used this herb personally, therefore I am not in a position to pass a comment with certainty. However, what I can say is that a few of the people that have read my E-Book have used it. I also spoke to other people when I was doing my research on hemorrhoids and everybody told me it did not help them with their hemorrhoids. Having said that, even if it did or could help you in any way with your hemorrhoids, it is still not suffice to get rid of hemorrhoids for ever. The magic word here is "forever"
You would still need to consider the other treatments available to help with your hemorrhoids.